Offer your members of staff a work setting that spells calm, tranquillity and comfort to host your corporate seminars, conferences, sales force meetings, study or team-building days. Le Forgeron offers you three modular air-conditioned rooms featuring high-performance equipment allowing you to host from 15 to 190 participants. The dining rooms, sun lounge and terrace lend themselves to the most prestigious receptions and the most studious meetings. Each room has a different interior design. The Auberge du Forgeron has four air-conditioned rooms that can accommodate 15 to 190 participants. The quality of its accommodation, equipment, fine food and welcome are the guarantee of a successful seminar. The little added extra: a regional gourmet dinner is planned for the evening of your seminar. In addition, extra activities such as go-karting 1 km away or an introduction to golf can be offered. We offer you our services at the Auberge as well as off the premises (at home). The Auberge's gourmet restaurant welcomes you in its plush atmosphere for your cocktails and/or your evening. Let yourself be guided and won over by Chef Philippe Bélot's suggestions showcasing his decidedly offbeat and creative cuisine or traditional dishes from three generations of chefs at the Auberge du Forgeron. 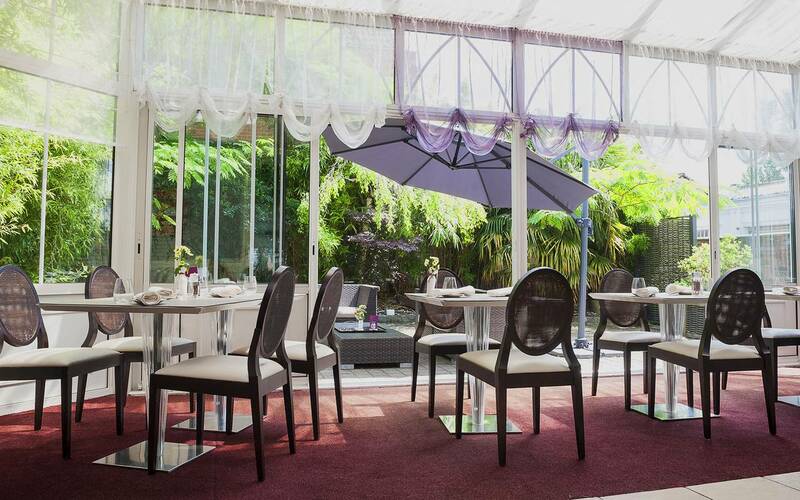 The dining rooms, sun lounge and terrace lend themselves to the most prestigious receptions. Each room has a different interior design. Our sales team is at your service to assist you in making your plans a reality.